Astoria Plaza, one of the country’s premier full service residential suites, has once again set the new standard in urban living by transforming its brand with a new logo. 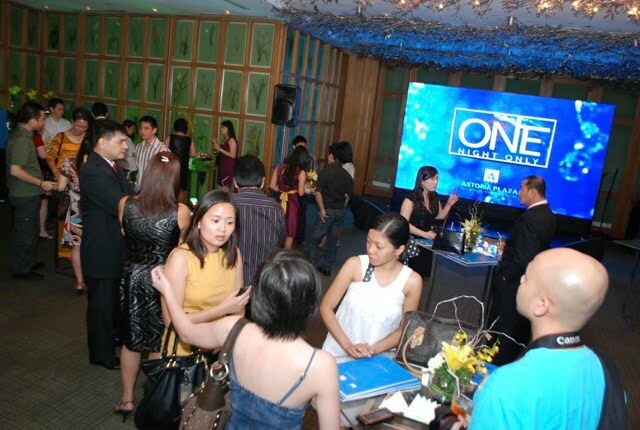 This was announced in “One Night Only," an exclusive media event held last March 4, 2010 where Astoria Plaza also unveiled its new logo. Media friends and bloggers all gathered in the chic Hampton Room of Astoria Plaza as they eagerly waited for the momentous celebration to begin. Starting the event was Astoria Plaza Hotel Manager Ping Regalado’s welcome remarks. He invited the guests to watch a short presentation about the rationale of the new logo. Then the VP for Operations Vivian Ng presented an ice carving where the new logo was embedded. 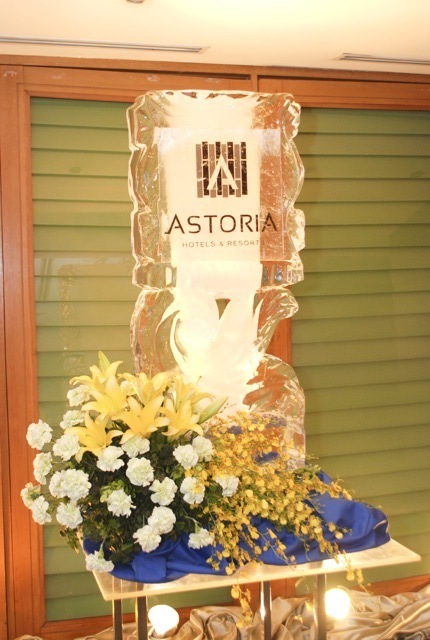 The new logo of Astoria Plaza symbolizes contemporary luxury that Astoria Hotels and Resorts are known for. The lines woven together signify the union of visionary inspirations evident in the designs and features of the hotels and resorts. It also signifies the concerted effort of the staff in providing quality service for the ultimate customer satisfaction. It was indeed a night of transformations for Astoria Plaza. 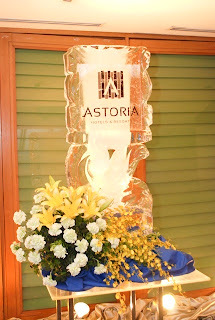 The new logo breathes luxury and comfort—something that Astoria Plaza is known for. Truly, the new logo will help make new waves for the country’s premier residential suite. As one of the premier full-service residential suites in the country, Astoria Plaza provides comfort and luxury right at the heart of the city. Located in the heart of the Ortigas Center business district, Astoria Plaza is within walking distance to leading shopping centers, malls, hospitals, universities and electronic railway transits. With spacious rooms ranging from a minimum of 60 sq. meters to a maximum of 130 sq. meters, guests can relax and enjoy living the high-life without staying too far away from their workplace. It is perfect too, for travelers, who want to experience world-class service yet feel like they’ve never left home. Astoria Plaza boasts of its world-class services and amenities. Enjoy a quick dip in the lap pool after a long day from work or relieve your stress with the soothing services of Stresscape Spa. You can stay fit and trim with its indoor gym facilities. Eat your heart out in Astoria Plaza’s Café filled with mouthwatering dishes to feed your appetite. Astoria Plaza has concessionaires for your various needs like: Santis Delicatessen, McGill Cosmetic Surgery Clinic, Travelnet, Genesis Valet Shop and Laundry Service, Aphrodite Dermatological Clinic and Ave Jewel Salon. With a wide variety of amenities and facilities available at Astoria Plaza, you’ll never run out of things to do. Having the comfort of your home and luxury all rolled into one is truly what Astoria Plaza is known for. Seasoned hoteliers have committed themselves into providing guests with the utmost in customer satisfaction. Personal care is given in the execution of every kind of service to ensure that guests will leave the hotel satisfied. Be above the rest. Settle with nothing but the best. Live the good life amidst stylish Zen-inspired settings yet stay close to where the action is. Living in paradise has never been this close to home. Astoria Hotels and Resorts bring a new meaning to living in paradise as they open a new hotel in beautiful Boracay. Boracay Island is a famous travel destination not only with local residents but also with foreign guests as well. Known for its mesmerizing white sand beach, various water sports and activities, as well as, an energetic and dynamic night-life, Boracay is definitely an all around island getaway fit for any lifestyle. Astoria Boracay is a 3,000 square-meter piece of paradise located right along the shoreline of the island’s Station 1 and offers a new living experience for both first-time travelers and frequent visitors. With more than 39 available rooms to choose from, Astoria Boracay has something to fit your choice to make your vacation more luxurious. You can choose rooms from several kinds of spacious De Luxe rooms to the luxurious Honeymoon Suite that ranges from 26 to 50 square meters. Other amenities of the resort includes a coffee shop, sunset bar and lounge, outdoor swimming pool and function rooms great for conferences and social gathering, Internet access, and many more. Welcome to Astoria Plaza—chic urban living at its finest!